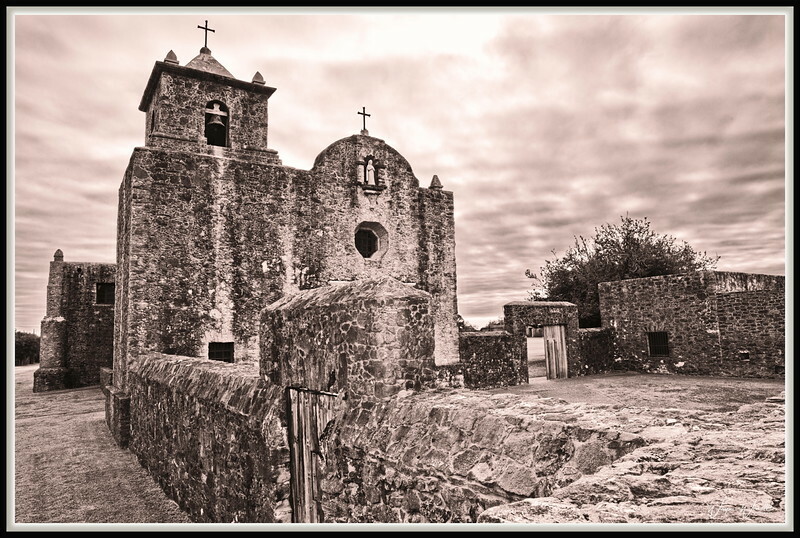 Located just south of the city of Goliad, Texas, Presidio La Bahia, is a significant landmark in Texas history. It was originally built by the Spanish in 1747 to secure Spain's hold on Texas. In the Mexican War of Independence which began in 1810 the Presidio came under siege with Mexico gaining the fort. In 1821 La Bahia was once again the under siege by Americans protesting the surrender of Texas to Mexico. The Americans surrendered and the Mexico achieve independence. At the start of the Texas Revolution, La Bahia was occupied by Mexican forces. It was taken by Texians in October 1835, and Col. James Fannin became the commander of the troops at La Bahia. They were initially ordered to take Bexar but his soldiers were not equipped for the long march to San Antonio. He was ordered to fall back to Victoria. As the Texians retreated, they were attacked by Mexican forces under General Urea at Coleto Creek. Fannin surrendered his men and the Texians were forced to march back to La Bahia where on March 22, 1836 they were executed by Mexican soldiers. The event is known at the Goliad Massacre. At the Battle of San Jacinto, the Texians yelled two phrases, "Remember the Alamo!" and "Remember Goliad." There is perhaps no other ground in Texas that was more fought over than Presidio La Bahia. My thanks to Bill Boyd for his recommendation of Nik Software package and the Silver Efex Pro for black & white processing. I installed Nik as a Photoshop plugin and use it as the final step beginning with Lightroom-Photoshop-Nik plugins in that order. Well-defined textures! Thanks for the information; places like this beg for their stories to be told and their history known to the world! Excellent capture, very interesting info & super processing... so well done! Oops I mean you and Loyd inspired me to go to Goliad through your photos. This is such a wonderful capture. Thank you too for the history and information too. We are taking a driving vacation after Christmas and will be stopping in Goliad as well. You and Wayne have inspired me to visit there. I have used Nik plugins for years, and there's not a better one particularly for black and white photography. I also have the HDR Efex Pro which I really like. I don't use it a lot, but it's easy and returns some great results. It seems that the sweet spot is (for me at least) a 5-exposure set. Nice work here! Well Done. Interesting Info too. Perfect in black and white! I tried a Nik trial long ago and liked it very much...no sure why i didn't buy it!